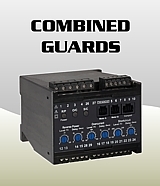 The digitally controlled ISOPAK2xx adds to Megacon's wide range of ISOGUARD products for insulation and earth fault monitoring and protection. The purpose of ISOPAK2xx is to selectively address level and polarity of earth faults in live battery and DC power supply networks. An intelligent highest up function highlights the highest level of hazard in the system and only alerts the operator when conditions for an impending danger are present. The first-up function latches the safety status lamps until reset. In this way the operator is immediately notified, but can await additional details following the next sequences of polarity scanning. The LED bargraph meter continuously displays the earth current of the highest channel in the system at any time, as a percentage of the channel's set trip level. This silent annunciation will not distract the operator's attention, but at any time a glance at the colour of the bar reveals the present safety status of the whole system. 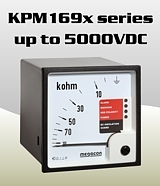 The DC leakage current is measured by electronic AG-sensor, inserted in each monitored load circuit. The measuring method is based on the principle that the POSITIVE and the NEGATIVE current in a fault free load circuit sum to zero. If an earth fault is present the fast response sensor detects the difference between the two currents and produces a proportional error signal. 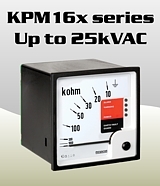 The sensor is rated max 500VDC. 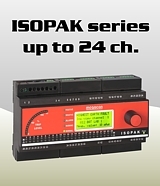 A single ISOPAK2xx can be used in up to 4 galvanically separated 6 to 60VDC networks. 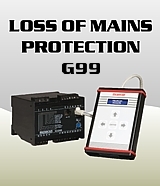 This function performs selective scanning of leakage current alternately from POSITIVE or NEGATIVE pole. 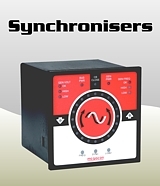 POLARITY lamps (POS/NEG) indicate the polarity of the earth fault and may ease fault finding. 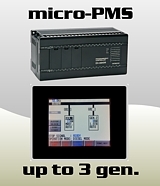 ISOPAK2xx automatically configures to operate in either a FLOATING (fully isolated), a POSITIVE pole or a NEGATIVE pole grounded DC network. Any number of ISOPAK2xx with its Sensor Controller MML204 may be parallelled in a chain with a common master PC, to supervise and log any number of channels and networks.